I don’t think I know how to really want something. I don’t know if I ever have in my post-puberty life. Because I’ve learned that I need to be okay with not getting everything I want in this life. I need to be okay with loss and disappointment. I need to detach myself from this world and put more focus on the hereafter. In the process of training myself to do that, I’ve also trained myself to just not want things very strongly so as to avoid disappointment and overattachment to this world. Now I feel it has become a problem, because now it’s hard for me to pray for things. How can you sincerely ask God for something when you don’t intensely want it? There’s a fine line between trusting God to give you what you pray for and being okay with not getting it. And in trying to navigate where that line is, my duas have felt fake and insincere. I noticed this when I was applying for graduate school. I realized last summer that as much as I grumble about continuing school, I did really want to go to grad school. And there was a specific program in a specific school that I had been wanting to get into for virtually all of undergrad. So this past winter, when it came time to fill out the application and then go for the interview, I had to revisit that idea of really wanting to go to the school. As I visited the campus and talked to some of the current students, I realizes that I really wanted to get in to this program. When it came time to tell the school why I wanted to go there, and then tell God the same thing in my duas afterwards, I was at such a loss of how much I should allow myself want this. It was my top school, but it was also competitive and I had already been rejected from there once before. If I was really relying on God, I would allow myself to be okay with not getting into the program. But if I didn’t allow myself to feel that desire, how could I take the interview and my subsequent duas seriously? So I decided to allow myself to want it. I wanted to get into this program more than anything I have wanted in years. I allowed the feeling of desire and longing to fill my heart so that I could give my all in the interview and shed tears when praying to God to allow the interviewers to see the potential in me. Alhamdulillah, by the grace of God, I got in. I am finally enrolled in my dream program at my dream school. Alhamdulillah. Alhamdulillah. Alhamdulillah. But I still have my “wanting” problem. What if I hadn’t gotten in? Would it have been worth the disappointment to have wanted it so badly? Or was my wanting it and praying for it a way of relying on God that I hadn’t tried before, and He rewarded me for it? I still don’t have the answers to these questions. I only have gratitude. Graduating is such an odd thing. So far, I have had three graduations in my life: elementary school, middle school, and high school. Graduation for most people is a time of excitement and celebration, however for me it has always been more bittersweet and sad than happy. While others find excitement in anticipating new experiences in the next stages of their lives, I find comfort in familiarity. I remember being so sad during my final week of high school, to the point where I was almost in tears, at the thought of leaving my friends and the halls of my school that were filled with so many memories. I was afraid of college back then, and high school was all I knew. Now I am getting close to my college graduation, and I’m not quite sure what I feel. I hadn’t really thought about it at all until today, when I finally stepped back on my university campus for the first time in months. Walking around campus and realizing that in less than a year, those buildings won’t be my school anymore, was surreal. We were having somewhat of a reunion iftar with a bunch of the other Muslim girls from my university, and as I was talking to them, I realized that in less than a year, I won’t be seeing them around anymore either. Quite a few of them I actually met for the first time today, and now it’s like I already have my foot out the door getting ready to say goodbye. But I don’t feel that sadness that I felt when graduating high school. I’m sure it will come, but at the moment everything is just passing over me. I think the reason is that with college graduation, we are all so busy with testing and applying for post-graduate programs and looking for jobs that there isn’t any time to get sentimental. We are all so stressed out that we don’t have any more room to get emotionally sad. I remember how excited all of the seniors last year were about graduating, but it still hasn’t hit me yet that I will be one of them very shortly. Yeah, it’s not Ramadan-related at all, but that’s just what I was thinking about today. Everyone I know is growing up so fast and our lives are changing so much. Sometimes I worry that I am going to be so caught up in everyone else’s changes that I will forget to keep up with my own life. So…no quote today. My Companions chapter was really short and to be quite honest I was too tired to try to figure out how to talk about it in an inspiring way. Instead, I come today with a video. It’s short, only a little over 3 minutes, but it serves as a reminder of how important it is for families to pray together during Ramadan. Ramadan is the only month throughout the year that my family prays Fajr and Maghrib together in congregation every single day. I remember on the first day of Ramadan, I knew it was Ramadan when I heard my dad reciting Qur’an as he led my family in Maghrib prayer. This year, for the first time ever, we have started praying Taraweeh prayers together every night. I am so happy that we are doing this. As my sister and I have gotten older and we are all separating to do our own things, praying in Ramadan is one of the only things that we all consistently do together as a family. Standing in prayer behind my dad is one of those Ramadan memories that will probably stay with me for the rest of my life, inshaAllah. 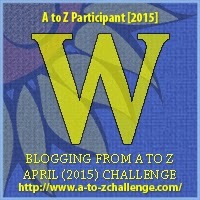 Blogging from A to Z Day 23: What Do You REALLY Want? Since I started college, this is a question people keep asking me. In terms of my career, I keep being told to do what I really want to do. “Don’t limit yourself.” That’s another one I get a lot. Directly, from my family. Indirectly, from society. As in, don’t just settle with something that you aren’t really interested in. It’s funny because I don’t buy that the people who say this really mean it. Really? You really think I should just do what I want? It turns out, when I venture out and tell people what I do genuinely want to do, my answers are suddenly not good enough. I want to be a psychologist, more specifically a therapist. But, what do I really want to do? If I didn’t settle on psychology, what would I have wanted to do? I want to be a film-maker, or at least a film-critic. More than that? I want to be a full-time blogger. More than that? I want to be a novelist. More than all of that put together, I just want to be a mom. I want take care of my family. Notice that the farther I get into the “what do you really want” question, the farther from practicality I am. The farther from a steady income I am. I know that money isn’t everything, but it is pretty important. Money = food + housing. Back when I was a freshman, undecided on my major, my academic adviser told me to think about what I really loved, or what I really wanted to do as a career. Go into the field that I have passion in. Well, that’s great for my morale, but in terms of advising me on what career to choose – how I am going to make my living – was that really the best advice? Because if we’re talking about what I am really passionate about, I will have no way of making an income. People ask me all the time what I really want, but I don’t think my answer is what they were expecting to hear. Happiest when crafting, writing, recyling, upcycling and having fun! My obsession with Korean and Japanese dramas and music! I am recent graduate from Rutgers University. I've made this blog to express my thoughts and my photography. If anything comes off to be offensive, I apologize in advance.